It’s pretty hot here today. I think I’ll fix a pitcher of this for tomorrow, if I can wait that long….. I am going to preface this post by saying that I really didn’t take any “glamor shots” of the finished product of this recipe because we loaded it into a cooler, dragged it to a local park for an early 4th of July fireworks celebration, and drank it out of red solo cups. 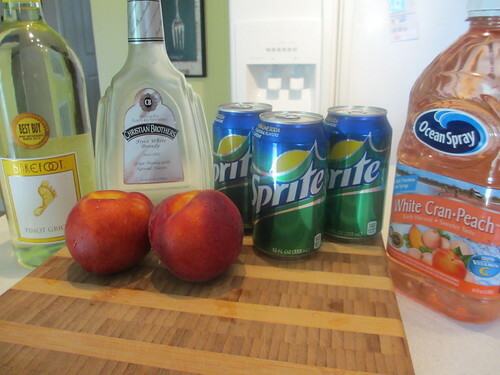 BUT, despite the lack of pretty pictures, please give this recipe a try, especially if you like peaches. I think it was one of my best sangrias yet! I think the most important detail about this recipe is that we started it the day prior to when we needed it. It had a good 24 hours for the flavors to meld. I firmly believe that this makes all the difference!